I found a new bottle of honey setting on the counter at my work’s kitchen. Without thinking, I lifted the honey bear and examined the label to see if it was pure honey. Indeed it was, pure local honey. I wonder how many people realize how tainted much of our “American” honey is. That is, the honey that sits on our grocery store shelves. Always check the label. It if doesn’t say pure honey, it could be from China. China is notorious for adding corn syrup to their honey and shipping it here to America where it’s sold for lower prices than the real deal. If possible, buy pure RAW honey. 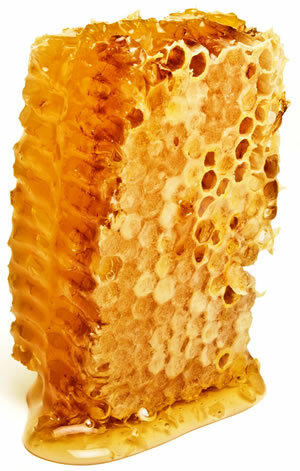 Raw honey usually comes from local beekeepers. It tastes better and it hasn’t been processed, so it still contains all of it’s natural beneficial nutrients and properties. Honey adopts healing properties of the plants where where the nectar was gathered. And it’s antibacterial. In fact, its the only food that doesn’t spoil or go bad. Raw honey will crystalize, which is why most store bought honey is processed. People don’t want to buy honey at the store if it’s crystalized because they think its old. What they don’t realize that raw honey is better for you and tastes better than the processed honey that pours out of the bottle. Just grab a knife and spread it on a slice of toast. Yummy! Speaking of antibacterial, mix 1 tbsp of raw honey with 1 cup of warm water, and you have mouthwash. Not only can you make mouthwash with honey, you can make hair conditioner, skin softener, lip balm, and medicinal treatments using honey. I’ve even heard that honey can be rubbed on bruises to help reduce the swelling. So the next time you visit the honey aisle, look twice at that label and grab the American-made local raw honey. I guarantee it’s worth the extra few bucks!